It occurred to me as I have tried to write these moments that what I am doing is a form of meditation. The realization that the mindfulness it takes to “notice something properly” is meditation led me to Thich Nhat Hanh’s book The Miracle of Mindfulness. After I began to accept this “capacity to be aware” of my surroundings as meditation I wondered why I had thought of meditation only as an emptying of my mind. It’s impossible to empty my mind. As soon as a thought slips in, I focus on getting rid of that thought (“out, out, brief thought” or something like that) and that causes me to focus even more on the thought itself. So to be truly aware makes more sense to me. What’s more, it has worked for me this month. In The Miracle of Mindfulness, I learned that there is a specific way to wash the dishes. It is not to wash them to get them done or to enjoy a cup of tea afterward. The way to wash the dishes is “in order to wash the dishes.” It is relaxing into the moment of what you are doing and being fully present at that moment. Mindfulness meditation is not about removing oneself from one’s “life” or environment, but rather about experiencing each moment as meaningful. The Foundation of Mindfulness begins with mindfulness of the body. Today I noticed my breath. I feel my intake of air. If you are interested in more ways to be mindful of the body, Thich Nhat Hanh leads the monks through a series of mindful movements. Lovely application of meditative process and thought into the everyday! I recently attended a natural healing workshop that gave meditators a place to focus – by doing “heart meditation.” You place your hand over your heart and focus or become mindful of it beating. It’s been long known you can slow down your heart rate when you are mindful of it. But the placement of the hand gives a concrete reminder of where to direct mindfulness! This is a great post! Thich Nhat Hanh is on my syllabus for my Writing and Healing Workshop at ASU! Love these posts Luanne! Keep them flowing! Renee, that is so cool at Thich Nhat Hanh is on your syllabus! Yes, I’ve done that with the hand over the heart, too. So beautiful. I thought you might be familiar with that! I’m so glad you’re in my life! Your blogs are great! I love the material you’re exploring here! I have some thoughts to float back to you. You’ve heard, no doubt, that men sometimes are not thinking about anything while women are always thinking about something. If this is true, then men might meditate in the empty-minded state and women in a more focused state than usual; i.,e., instead of thinking about several things (past, present, and future) at once, a woman might focus on (meditate on) just once thing in the present (meaningful moments). Also, I looked at the double sinks in your photo, washing on the right, rinsing on the left. I wonder: is that the arrangement everyone uses or just left handers? Also, I have become interested in yoga in the last few months. I privately call myself a “yoga bum” (not so private now) because I float from class to class and teacher to teacher and location to location and style to style. Breathing is always a key element, but my favorite class is the one that focuses most intently on it. Wilma, what an engaged response. Your ideas about male versus female ways of meditating are certainly thought-provoking. All I know is that for me when I am told at yoga class to “empty my mind,” I get very anxious. And you mention yoga–for me too the breathing is what I love most about yoga. The more the focus is on the breathing, the more enriching my experience. Re the sinks. I don’t know. 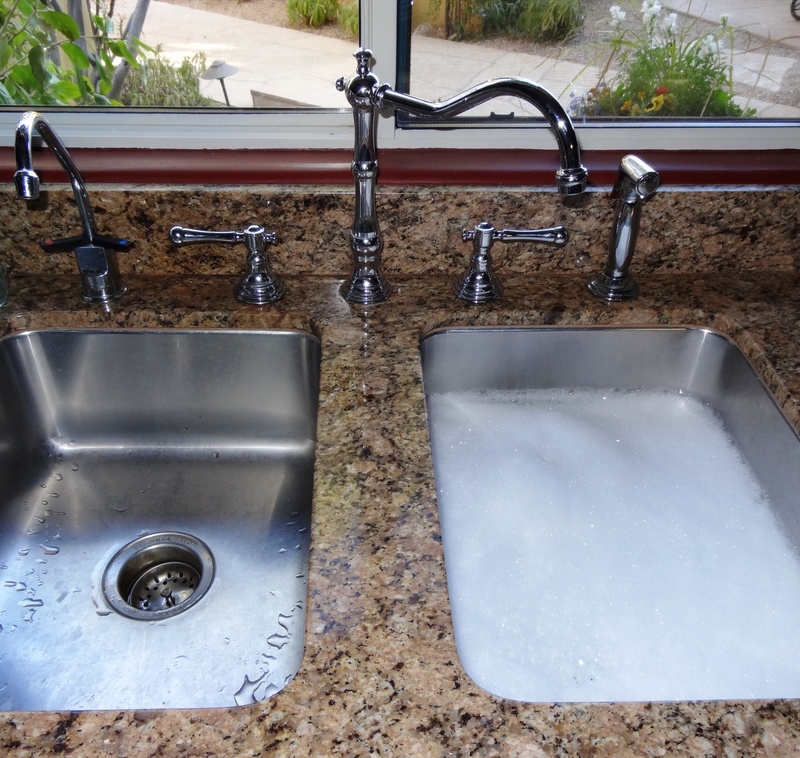 I thought the reason I chose to wash on the right was because there is a garbage disposal on the left. So now I am trying to think back to past homes and it seems to me that I have chosen this pattern other times, as well. And at my house both inhabitants are left-handed, so this arrangement makes it convenient for anyone to wash dishes. I admit that I am still working on washing them just to wash them. Maybe the disposal is always on the right. I’ve tried, at times, washing on the left and have not stuck with it. Sono convinto della grande utilità della conspevolezza!! Hi Claudio, thanks for reading and commenting! What does conspevolezza mean? Consapevolezza è sapere ciò che ci circonda, dentro e fuori di noi!. E’ sentire vivere la vita come flusso che ci attraversa e si riunisce all’universo che ci circonda! I thoroughly enjoyed this mindful contribution and video … very calming and inspirational … I feel grounded as I prepare to leave this respite. Thank you for sharing.